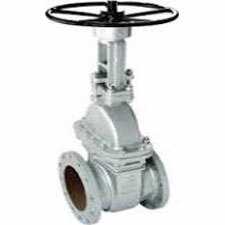 AMTECH offers gate valve -150 to 600 class in Flanged end , 800 to 2500 class in Threaded / buttweld/ socket weld end.Gate valves are generally designed to serve as isolation valves. In service, these valves are either fully open or fully closed. When Gate valves fully opened , the media which flows through the valve in a straight line with very little resistance. Gate valves must not be used in the regulation or throttling of flow media because of accurate control is not possible. Also , high-flow velocity of media in partially opened valves may cause erosion of the discs and seating surfaces area. The Vibration of wedge may also result in chattering of the partially opened valve disc. Gate valves are also operated by chain pulley when they mounted at height in plant. The Gate valves are used in thermic fluid with high temprature upto 350 degree.